We know—you can't buy a jar of Nutella for your own home, because then you'll just end up sitting at your kitchen table at dinner time with half the jar gone and a feeling of utter disgust/indegestion in your stomach. Fortunately, the Nutella "Spread the Happy" food truck tour is bringing reasonable portions of this delicious hazelnut spread to LA. 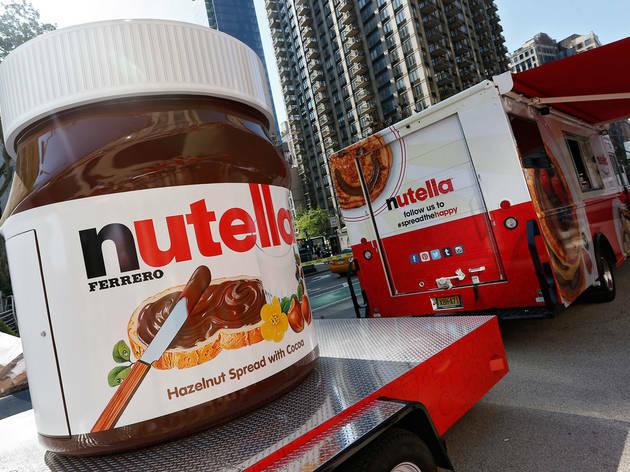 On Saturday and Sunday, the truck will hand out samples of Nutella paired with a variety of foods at Olvera Street Plaza; on Monday, the truck will be at LACC, while on Tuesday, it'll be at the corner of Broxton Ave and Le Conte. Along with sweet samples, Angelenos can play interactive games, participate in Nutella branded giveaways, and tweet/Instagram to their hearts content. 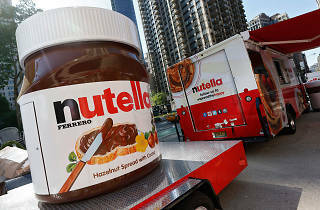 Check out the Nutella Tumblr page for exact info on the truck's location. I grew up with Nutella as a child in Italy and it still brings back childhood memories of how amazing it tastes.